Medical therapy should be tried first in Trigeminal Neuralgia Treatment.Carbamazepine, gabapentin, baclofen, and IV phenytoin are the most effective treatments. Oral phenytoin, valproic acid, clonazepam, topiramate, lamotrigine and pimozide are alternatives. Distal nerve blocks or ablative procedures generally are not recommended owing to a high incidence of early recurrence. More proximal procedures include retrogasserian glycerol injections andradiofrequency gangliolysis, which have acceptable recurrence rates and minor complications. Most patients with TN can be successfully treated with medical therapy; many will require lifelong medication, and some will require surgical intervention. Focal radiation (radiosurgery) has better long-term results. The Jannetta procedure involves intracranial exploration of the trigeminal nerve root and removal of aberrant blood vessels. It is the most successful surgical procedure, but it also has the most complications. 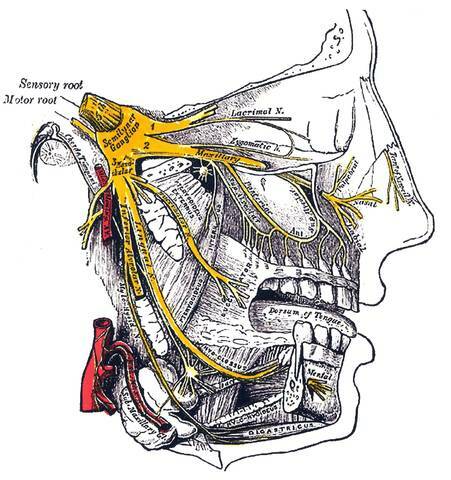 The trigeminal nerve, or cranial nerve V, contains both sensory and motor components and thus subserves and controls ipsilateral facial sensation and masticatory movements. Pain, thermal, tactile, and kinesthetic sensory stimuli are received from the facial skin, oropharynx, nasal mucous membranes, sinuses, teeth, palate, dura, and masticatory muscles. Motor fibers extend to the muscles of mastication as well as thetensor tympani and tensor veli palatini. The trigeminal brain stem nuclei are the spinal trigeminal nucleus and tract, the main (or principal) sensory nucleus, the mesencephalic nucleus, and the motor trigeminal nucleus. The nerve splits into three divisions: V1 (the ophthalmic branch), V2 (the maxillary branch), and V3 (the mandibular branch). The neurons of these branches have their cell bodies in the gasserian (or semilunar) ganglion (with the exception of jaw proprioceptive fibers). The gasserian ganglion resides in Meckel's cavein the temporal bone. The first adequate clinical description of the condition trigeminal neuralgia was made byFothergill in 1773. Thereafter,Charles Bell (1829)demonstrated that the trigeminal nerve subserved sensation to the face. The trigeminal ganglion was excised in the late 19th century by Rose (1890), and the celebrated surgeon Horsley first sectioned cranial nerve V through an intradural middle fossa approach in 1891. Early 20th-century studies focused primarily on physiology, and more modern research has integrated neurochemistry, neuropharmacology, and microsurgical interventions in the treatment of trigeminal lesions. In 1962, Blom first reported the successful treatment of trigeminal neuralgia with carbamazepine, a new antiepileptic agent at that time. In the evaluation of suspected TN, an MRI of the brain is indicated, even if there is no loss of sensation or other abnormality on neurological examination. Patient's history of facial pain is very important. The value of a dental evaluation is uncertain. There are no known associated disorders except for the known or suspected causes of secondary TN. Psychological problems may occur secondary to chronic pain. Secondary causes of idiopathic TN other than Multiple Sclerosis include syringomyelia, postmedullary infarction, aneurysm, basilar impression, and tumors, which include acoustic neuromas, epidermoids, meningiomas, schwannomas, and cholesteatomas. CARBAMAZEPINE proves effective in most patients (and help confirm the diagnosis). Provided toxicity does not become troublesome, i.e drowsiness, ataxia, the dosage is increased untill the pain relief occurs. When remission is established, drug therapy can be discontinued. If pain control is limited, other drug.- beclofen, lamotrigine, gabapentin, phenytoin- may benefit. Persistence of pain o full drug dosage or an intolerance of the drugs, indicates the need for more radical trigeminal neuralgia treatment. Operative trigeminal neuralgia treatment Peripheral nerve techniques nerve block with alcohol or phenol provides temporary relief (up to two years). Avulsion of the supra or infraorbital nerve gives more prolonged pain relief. A radiosurgical lesion of the trigeminal ganglion provides another alternative to high risk surgical patients. Traumatising the trigeminal ganglion/roots within meckel's cave by either glycerol injection or by Fogarty balloon inflation usually produces good pain relief with minimal sensory loss. Trigeminal root section: Through either a subtemporal or posterior fossa approach, the appropriate trigeminal root is identified and divided. Microvascular decompression: Exploration of the cerebellopontine angle reveals blood vessels in contact with the trigeminal nerve root or root entry zone in the majority of patients. Seperation of these structures and insertion of a non absorbable sponge provides pain relief in most patients, without the associated problems of nerve destruction. Radiofrequency thermocoagulation: The site of facial tingling produced by electrical stimulation of a needle inserted into the trigeminal ganglion, accurately identifies the location of the needle tip. When the site of tingling corresponds to the trigger spot or site of pain origin, radiofrequency thermocoagulation under general anaesthetic, produces a permanent lesion- usually resulting in analgesia of the appropriate area with retention of light touch. Pain Relief: Accurate comparison of the wide variety of techniques used for trigeminal neuralgia is difficult; all but peripheral nerve avulsion appear to produce similar results. Approximately 80-85% of patients remain pain free for a 5 year period, although some may relapse in the long term, particularly after balloon compression or glycerol injection. Results of peripheral nerve avulsion are less satisfactory with pain recurring in 50% within 2 years. Dysaesthesia/ Anaesthesia dolorosa: this troublesome sensory disturbance follows any destructive technique to nerve or root in 5-30 % of patients. Microvascular decompression avoids this problem and the risk of a severe deficit is low with glycerol injection. Coroneal anaesthesia: this occurs when root section or thermocoagulation involves the first division and keratitis may result. Mortality: microvascular decompression and open root section carry a very low mortality (<1%>), but this must not be ignored when comparing results with safer methods. This largely depends on the surgeon's personal prefernce and experience. 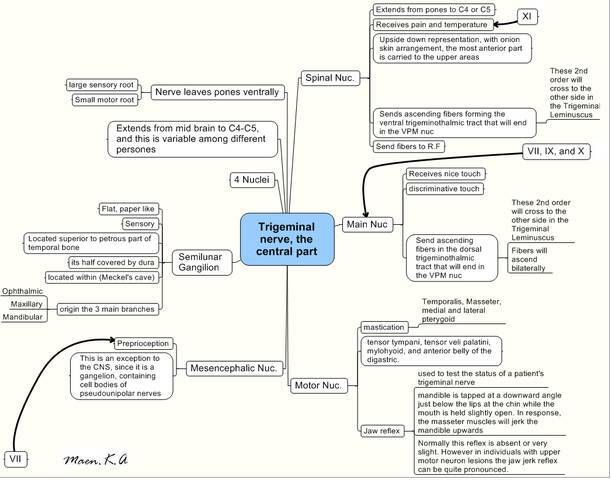 in most centres, the absence of sensory complications make microvascular decompression the procedure of first trigeminal neuralgia treatment choice, particularly for 1st division pain and for younger patients. Frail and elderly patients may tolerate glycerol injection, balloon compression and thermocoagulation more easily than other procedures. Both acupuncture and TENS are exciting great controversy at the present time in the Western world; their long standing use for chronic pain is being questioned because (again) of the lack of evidence. This remains a controversial field, but both techniques appear to be relatively simple, fairly safe in appropriate hands and reasonably cheap. Acupuncture again is said to work on descending inhibitory pain pathways and also to stimulate endorphins (as well as the body's natural cortisone). Both positive and negative results have been shown in a bewildering variety of trials. There is certainly a powerful placebo effect, but there also seems to be a significant analgesic component, albeit this might last for only a very short period, and the benefits seen with many patients may be due to a reduction in distress and disability engendered by their interaction with the therapist.